The Resident Tourist: Eleven Madison Park . . .
Lucky me...birthday weekend essentially turned into birthday week and somehow the days flew by before I had time to blink. 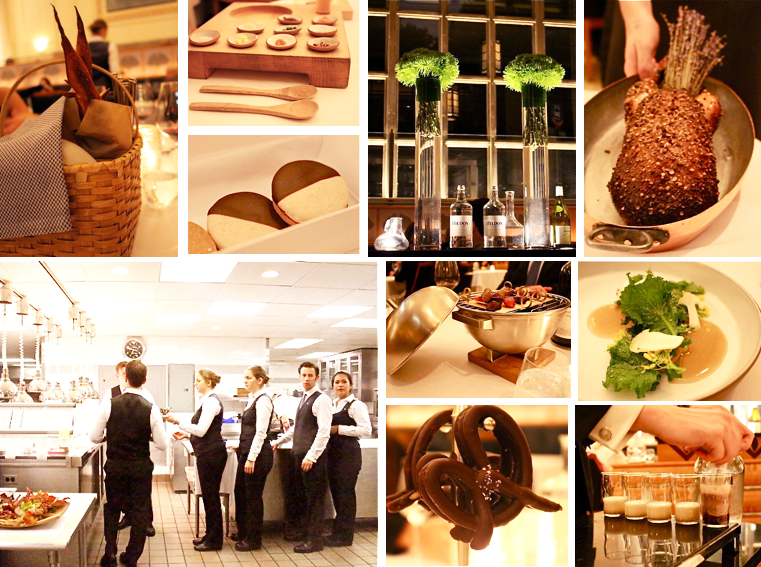 So a week (plus) later, here's a visual taste of Eleven Madison Park. I have to say, this is definitely considered the best restaurant in the country (and #5 in the world!) for a reason. Wow. What an experience dining here is. There were so many highlights I don't even know where to start. To begin, I should explain the basics... Dining here is a 15-course meal without a choice in menu. Of course, any dietary restrictions are easily (and deliciously) accommodated. Every dish is an experience in it of itself, yet somehow in the end the entire meal is incredibly cohesive and expertly rounded out. For instance, our very first bite was a NY-style black and white cookie, with a twist. It was savory rather than sweet and tasted of cheddar cheese and apple. It was delicious, I could have eaten five more of them. Our last bite perfectly book-ended the dinner. It was another black and white cookie that looked exactly like the first one, but this time tasted sweet, like chocolate and vanilla. It was inventive touches like this that made the meal so memorable. I could go on for pages (the dinner was 6 hours after all) but instead I think I'll give you my three highlights/standouts. One. Thanks to a dear friend, we were invited into the kitchen for pre-dinner cocktails and a view - which was super cool! It's amazing to see what goes on behind the scenes, you'd never imagine what an operation a kitchen of this caliber is. Two. The whole dinner was very interactive, entertaining almost. Many dishes were placed in the center of the table with instructions on how to eat them. One of the neatest courses was a carrot tartare, which was made at our table with a meat grinder. Then we were all given a serving on a plate with tiny bowls of spices, condiments, etc. We were told what each bowl held and then given the reigns to flavor our tartare to our liking. It was really fun mixing in the different spices and seeing what sort of combos we could come up with. Another dish came entirely in a picnic basket, while another included a magic trick with playing cards. Three. Many of the courses on the menu were New York inspired. You can only imagine how happy that made me... black and white cookies, Everything Bagel crumbs, a picnic basket (filled with local goodies), a mini-grill (the kind all New Yorkers illegally sneak onto their balconies), pretzels, egg cream soda... It was a NY themed feast! And I loved it. Really clean layout and great pictures!